A call to Dan O'Neill at Yachtzoo in Monaco this morning brings confirmation that Baglietto's 53m motor yacht Blue Scorpion has joined the fleet for sale and charter. Launched in 2006, her elegant Zen-inspired interior by Paszkowski accommodates 10 guests in a full beam master suite, two full beam double cabins and two twin cabins and has ample deck space. Blue Scorpion is available for charter in the Mediterranean for the first time at €220,000 in high season and €190,000 in low season. 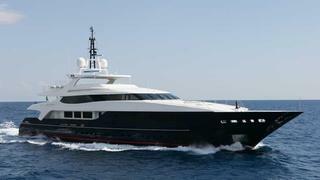 This superyacht's asking price is €29.5 million.